Five big winners at Suffield High: Hunter Adams, center, has become a New England wrestling champion. 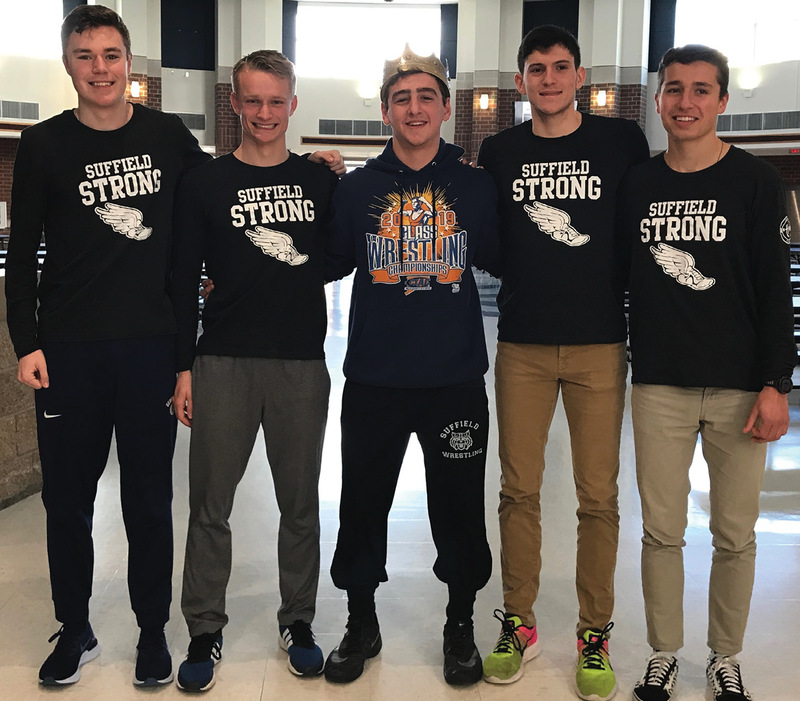 He is flanked by the four members of Suffield’s extraordinary indoor track relay team, including Jared Sharp, whose personal record stands out. From the left: Cam Miller, Jared, Hunter, Nick Sinofsky and Kyle Englander. Congratulations to Jared Sharp who was featured on Fox 61 in the CIAC Captains Spotlight. Jared is a junior at Suffield High School and has made All NCCC every season of his career. He finished third in the state decathlon last year. Jared has been on community service trips to Kenya, China & Ecuador. Congratulations to Jared for this well-deserved award. Congratulations to Hunter Adams for becoming a New England wrestling champion. Hunter is the first Suffield wrestler to ever win an open state title. Hunter has also been nominated for the athlete of the week award. Congratulations to Hunter! Congratulations are in order to Nick Sinofsky, Cam Miller, Jared Sharp and Kyle Englander for winning the 4×800 at the New England Championships with a record time of 7:49.96. These four athletes participated at Nationals and finished in sixth place, earning All American Honors. Anna Casinghino displays her 2018 award plaque for Connecticut High School Coaches Association Player of the Year for field hockey. 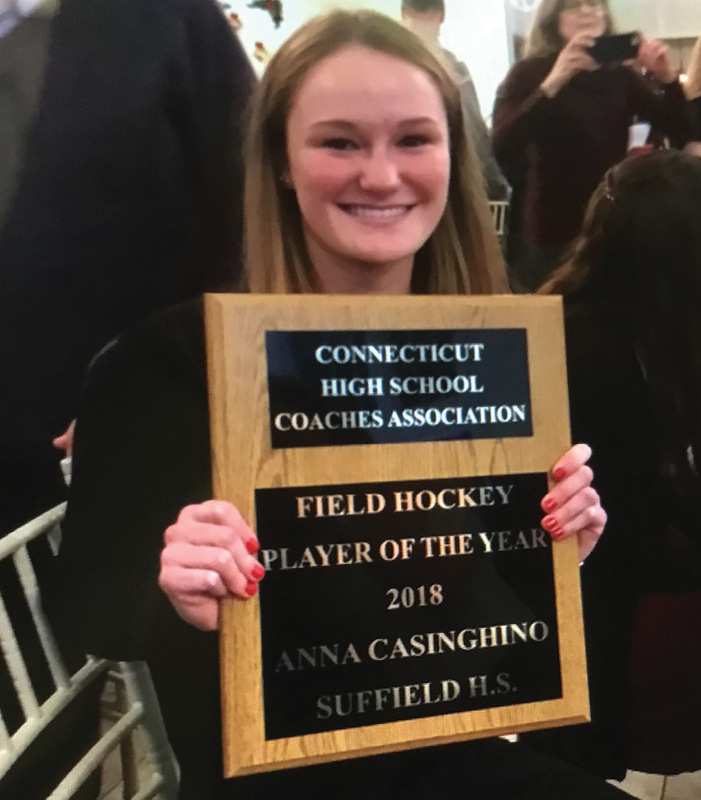 Congratulations to Anna Casinghino on being named the Connecticut High School Coaches Association Player of the Year for 2018. Anna was picked as the top field hockey player in Connecticut. This is the highest honor that can be awarded from the Coaches Association. Anna had an amazing career on the field hockey field at Suffield and will be missed next fall, when she joins the UConn Women’s Field Hockey team.